Leaving Colorado was strange, knowing that this wasn't just a vacation. We had lived in CO for over three decades! We already had plans to return, but that was 3 months away, not 1 or 2 or 3 weeks. It really felt different because we were actually moving, and we knew it was another step toward our dreams. The plan for quite some time has been to move to Florida, and then use that as a jumping off point to other adventures south of there. So, off we went in a southeasterly direction. We were initially headed to Amarillo, TX (from Westminster, CO) which made for about a 7 hour day. It started on the good ole interstate system, trucking along at 75 mph toward the east, but within a couple of hours we were veering south onto two lane blacktops. We passed through towns with names like Wild Horse, Kit Carson, and Big Bend. It felt like a passage back in time, like it was the 60s again, sometimes the 1860s, looking at that terrain from old John Wayne movies. The modern world was not far off though, as we also drove by a LOT of those white towering windmills. They must get a lot of wind out there! We decided right up front that we were going to drive the speed limit. Why would I do such a thing, when I've been speeding (a little bit) for years?! Well, for the first time in decades we felt like we had the time to slow down just a little. It's not true of course, there is always time in your lives but that was the feeling we had. We also decided we have more time than money now and that is starting to drive a few decisions, so why risk a $100+ ticket for a few extra minutes we don't care about anyway? Finally, there are many stories about people with CO plates getting pulled over in other states for any excuse at all, so they can search your car for the evil weed (see this link). The car is clean of course, they wouldn't find anything, but I like to avoid conversations with law enforcement if I can. Most of them are very good people, but they certainly have the power to ruin your whole day. So we've made that transition into retirement - now we're the old folks getting in everyone's way, sorry! When we got to the Oklahoma line (we were really just cutting through the panhandle for an hour or so), all I remember is wind, lots of wind, and bad roads. Sorry, OK folks, but that's what I saw in the western part of your state. To be fair, the wind machine didn't turn off at the Texas state line either, and we were planning to car camp. I was really starting to worry about our upcoming night's sleep. My weather app kept saying it was 97 degrees in Amarillo (yes, 97 degrees!) with high winds to go with it. I kept wondering what that was going to feel like when we set up to sleep in our Honda Element (the blue box on wheels). I knew it would cool off after dark, this is a sure thing in dry climates, but the sun was really very impressive that day in mid-June on the great plains of Texas. We drove friendly, the Texas way! We are equipped with a car tent that attaches to the back of the vehicle, giving us extra space out the back, and extra fresh air. I also have a home-brewed window screen system which uses magnets to hold screens on the front windows so we have good airflow. But the wind was making it look like setting up the tent and screens was going to be impossible, and it turned out I was right – things were looking bad. But when we arrived, the KOA we had booked (our first KOA!) was excellent and they gave us a very nice site with a shade tree – things were looking up! We unloaded our bikes with the rear rack and got into our car camping gear. The KOA was another step back in time (I guess it just kept us there in the 60's). They had hay rides, clean bathrooms with really nice showers!, dog play areas, a pool, cabins, and camping for tents, cars, and massive RV's. We didn't partake in all of that, but we did enjoy a bottle of wine (a gift from a good friend) sitting on our picnic bench on the first night of our big adventure. It was so exciting, staring at the stars (remember the stars?) and talking about how we were really doing this thing! This was the end of the first day of the rest of our lives. There was no turning back, we had no home to "go home to", but home is where the heart is, right? I was very impressed with the whole KOA scene, and the temps did indeed fall at night, so much so that we were very comfortable and slept well. The next morning we were up and at 'em, packing the car to go to Austin, home of the Texas Longhorns, huge colonies of bats, live music, and good craft beer (probably a few others things too!). Several hours later, we were hitting the outskirts of Austin but we didn't make it before rush hour, as we were advised by our AirBnB hostess. Wow. The traffic there was worse than I've seen in Orlando or Denver (but not L.A.! ), at least it was that night. We were in crawling traffic for at least an hour, I'm sure made worse by our not knowing the area. We finally did make it to the condo complex and met our AirBnB hostess (our first AirBnB!). 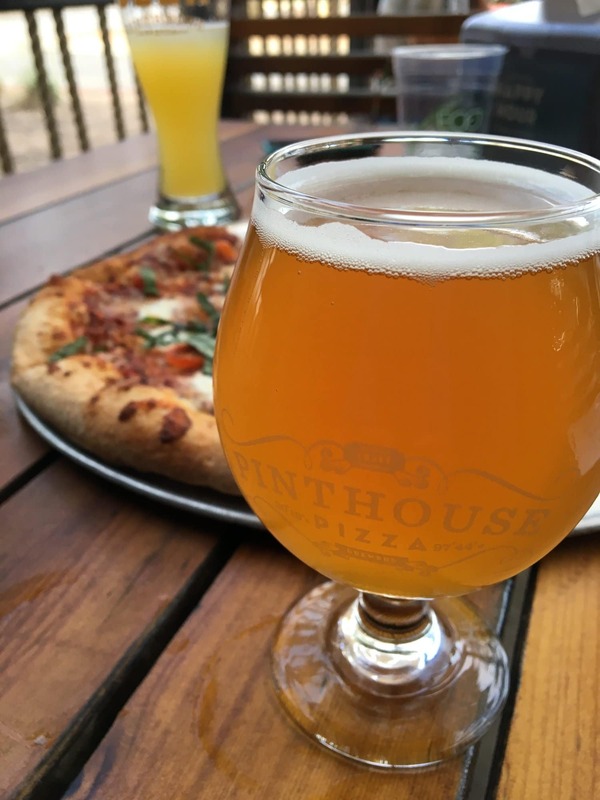 Based on her suggestions, we enjoyed a few things within walking distance there, like Pinthouse Pizza and Beer, with an excellent New England style IPA and very tasty pizza! The following day we headed out on our bikes with the dogs in our saddle baskets – we were looking for the trail system that leads downtown. A friendly cop told us it was down the hill (more on that later) but he didn't know if it was rideable. He seemed to think it was more a walking trail. Well, we found it and it was beautiful there in the woods of this big city. Of course, soon we were lost in the woods, where Deb proclaimed, "There are no wrong turns, only new adventures around every corner!". I was already planning for us to be eating roots and berries and gathering rainwater on leaves to survive. I also think the officer was right about it being a walking trail, it was so narrow we were squeezing through bushes and going up and down lots of rocks and roots. No problem, we came from Colorado, and we rode anyway! With our trusty phone GPS and a couple of friendly hikers, we eventually found our way out of the woods (no roots or berries were harmed during the filming of this episode). Then we had to go back up that hill. Yes, it was a hint when we were flying down it earlier, breaking the sound barrier, but we came from Colorado! It would be no problem, we were invincible with our high altitude lungs! So there we were riding back up it in our lowest gears; we were about ¾ of the way up when I hit the wall and had to quit, it was just SO steep! My heart was about to jump out of my chest and my lungs were burning. Deb had hopped off the saddle as well and she was quickly complaining that her dog Maxwell was SO HEAVY (he's 9lbs compared to Kirby at 6lbs). So we walked our bikes up the remainder. During that part, I came to realize that “¾ of the way up” was a fantasy – we were at the halfway point at best when we quit riding! Just walking our bikes up it was crazy hard! Imagine walking a bike up the wall of the Grand Canyon – it was basically that. 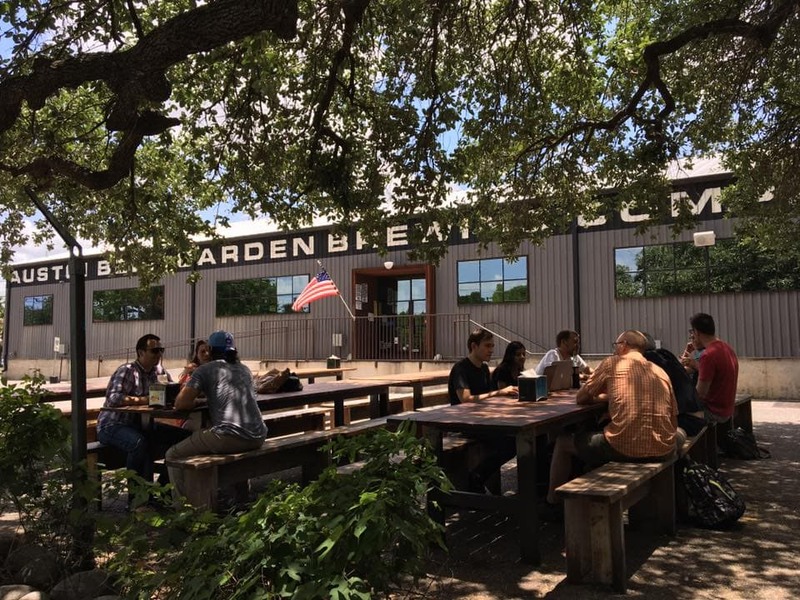 To get me to the top Deb promised me a refreshment, so of course I made it and we worked our way to the Austin Beer Garden Brewing Company, aka ABGB. And this place was wonderful! Steamy weather (we sat outside in the garden) but with our doggies that was the only choice. At that point I felt a little weird, after all that sweating I figured I was dehydrated. So to rehydrate I had an ice-water, a Mexican Coca-cola (medio litro, made with cane sugar! ), and a beer. I ordered inside next to a dude sporting a shaved head, a three-day stubble, pink tights, and a tutu. Not that there's anything wrong with that! ABGB was a great stop, really enjoyable. They use community picnic tables for seating inside and out, although that day wasn't crowded so we didn't sit with anyone else. The beverages were so good too! (the water, the Coke, and the beer!) We had more than one beer actually, and watered the horses (dogs). We watched the people and the trains, counting the cars as they rolled by. Deb said that she'd never had time to count the cars before that day! It was a very peaceful afternoon, and then we headed back to clean up for the evening. Nighttime turned into a great time as well, we gained more local knowledge from our AirBnB hostess, and ended up downtown at an outdoor honky tonk listening to live music, chilling with our pups, and drinking what else but beer?! 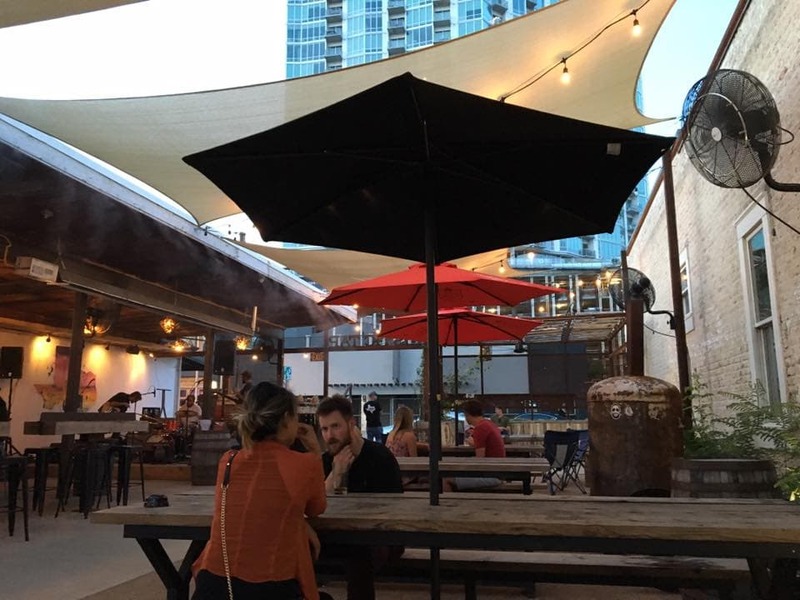 The live music scene is Austin is famous for good reason and the open air bars are simply the best! Walking down the street gives you endless choices for places to visit, and the people-watching is great. It was a wonderful afternoon and evening, we were certainly impressed with Austin! Open air, fans+misters to stay cool, live music, great beer = Austin, TX! I was more than a little amused at how many hours we really did drive between the Oklahoma and Louisiana state lines all within the bounds of Texas - I think it was around 19 hours for us. 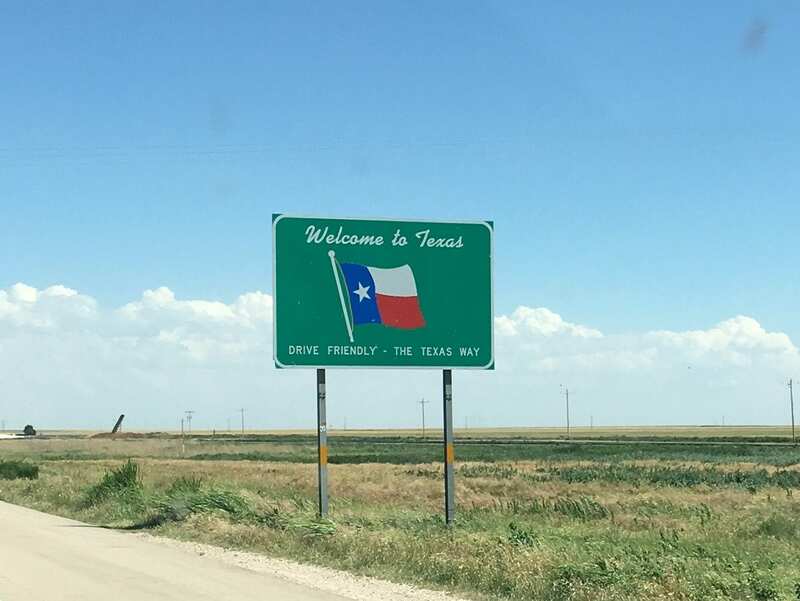 It seems everything is bigger in Texas – including Texas! All in all, we really enjoyed this part of the journey, but we're fixin' to head further south for oysters and po'boys and some real rain! Stay tuned. I especially enjoyed the Jerry Reed background music while reading the road trip portion of the blog! I am enjoying your writings, keep it up.